Baptism (from the Greek noun Βάπτισμα baptisma; itself derived from baptismos, washing) is a Christian rite of admission (or adoption) into the Christian Church and Faith. It is one of the Seven Sacraments of the Christian Church; frequently called the "first sacrament", the "door of the sacraments", and the "door of the Church". It is the sacrament through which the Paschal Sacrifice of Jesus Christ applies to souls, making them members of the Church and opening the path to eternal salvation. In Catholic and Biblical teaching, baptism is necessary for salvation. The word Baptism is derived from the Greek word, bapto, or baptizo, to wash or to immerse. It signifies, therefore, that washing is of the essential idea of the sacrament. Scripture uses the term baptize both literally and figuratively. It is employed in a metaphorical sense in Acts 1:5, where the abundance of the grace of the Holy Ghost is signified, and also in Luke 12:50, where the term is referred to the sufferings of Christ in His Passion. Otherwise in the New Testament, the root word from which baptism is derived is used to designate the laving with water, and it is employed, when speaking of Jewish lustrations, and of the baptism of John, as well as of the Christian Sacrament of Baptism (cf. Hebrews 6:2; Mark 7:4). In ecclesiastical usage, however, when the terms Baptize, Baptism are employed without a qualifying word, they are intended to signify the sacramental washing by which the soul is cleansed from sin at the same time that water is poured upon the body. Many other terms have been used as descriptive synonyms for baptism both in the Bible and Christian antiquity, as the washing of regeneration, illumination, the seal of God, the water of eternal life, the sacrament of the Trinity, and so on. In English, the term christen is familiarly used for baptize. Having considered the Christian meaning of the term "baptism", we now turn our attention to the various rites which were its forerunners before the New Dispensation. Types of this sacrament are to be found among the Jews and Gentiles. Its place in the sacramental system of the Old Law was taken by circumcision, which is called by some of the Fathers "the washing of blood" to distinguish it from "the washing of water". By the rite of circumcision, the recipient was incorporated into the people of God and made a partaker in the Messianic promises; a name was bestowed upon him and he was reckoned among the children of Abraham, the father of all believers. But above all must be considered the baptism of St. John the Precursor. John baptized with water (Mark 1) and it was a baptism of penance for the remission of sins (Luke 3). While, then, the symbolism of the sacrament instituted by Christ was not new, the efficacy which He joined to the rite is that which differentiates it from all its types. John's baptism did not produce grace, as he himself testifies (Matthew 3) when he declares that he is not the Messias whose baptism is to confer the Holy Ghost. Moreover, it was not John's baptism that remitted sin, but the penance that accompanied it; and hence St. Augustine calls it (On Baptism, Against the Donatists, Book V) "a remission of sins in hope". As to the nature of the Precursor's baptism, St. Thomas (III.38.1) declares: ”The baptism of John was not a sacrament of itself, but a certain sacramental as it were, preparing the way (disponens) for the baptism of Christ.” Durandus calls it a sacrament, indeed, but of the Old Law, and St. Bonaventure places it as a medium between the Old and New Dispensations. 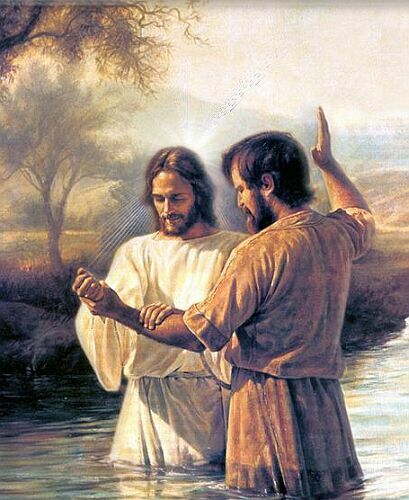 It is of Catholic faith that the Precursor's baptism was essentially different in its effects from the baptism of Christ, It is also to be noted that those who had previously received John's baptism had to receive later the Christian baptism (Acts 19). Christening is the old name for Baptism. Usually Christening refers to the name given to the infant or person during baptising. When babies are baptised, their parents promise to help them grow up as Christians. Water is poured on the baby to symbolise a fresh start with God. Also, the purpose of a christening (or the more modern term, baptism) is providing a symbol that you want to bring your child up in the eyes of God, and will try to provide them with Christian beliefs to the best of your abilities. The water represents a fresh start after having been cleansed from original sin. 1. the ceremony of baptism, especially as accompanied by the giving of a name to a child. 2. a public ceremony in which a new ship is formally named and launched. 3. an act or instance of naming or dedicating something new. Traditionally, Christening was the naming ceremony to give the child a Christian name. It was usually done at the same time as baptism, so the two got intertwined. During the baptism ceremony, parents are asked what name they have given their child. Baptism brings a child into the Christian family. For Catholics, it is the sacrament where a person is, thanks to Jesus, washed clean from original sin. It is the first of our three sacraments of initiation (the other two being Confirmation and Eucharist). Baptism is the sacrament of faith. But faith needs the community of believers. It is only within the faith of the Church that each of the faithful can believe. The faith for Baptism is not a perfect and mature faith, but a beginning that is called to develop. The catechumen or the godparent is asked: "What do you ask of God's Church?" The response is: Faith. The sign of the cross, on the threshold of the celebration, marks with the imprint of Christ the one who is going to belong to him and signifies the grace of the redemption Christ won for us by his cross. Since Baptism signifies liberation from sin and from its instigator the devil, one or more exorcisms are pronounced over the candidate. The celebrant then anoints him with the oil of catechumens, or lays his hands on him, and he explicitly renounces Satan. Thus prepared, he is able to confess the faith of the Church, to which he will be entrusted by Baptism. The baptismal water is consecrated by a prayer of epiclesis (either at this moment or at the Easter Vigil). The Church asks God that through his Son the power of the Holy Spirit may be sent upon the water, so that those who will be baptised in it may be "born of water and the Spirit." It signifies and actually brings about death to sin and entry into the life of the Most Holy Trinity through configuration to the Paschal mystery of Christ. The use of water as a purifying substance is universal. Water is also symbolic of the beginnings of life, and human life which emerges from the waters of the womb. The anointing with sacred chrism, perfumed oil (olive oil mixed and perfumed with other precious oils) consecrated by the bishop, signifies the gift of the Holy Spirit to the newly baptised, who has become a Christian, that is, one "anointed" by the Holy Spirit, incorporated into Christ who is anointed priest, prophet and king. The white garment symbolizes that the person baptised has "put on Christ," has risen with Christ. The candle, lit from the Easter candle signifies that Christ has enlightened the neophyte. In him the baptised are "the light of the world." The solemn blessing concludes the celebration of Baptism. At the Baptism of newborns the blessing of the mother occupies a special place.